I've been a long-time "Benebabe", but I feel like I haven't shared too many of my favourite Benefit products on my blog! Benefit's High Beam was actually the first high-end product I ever owned, and now I'm on my second bottle. I love Benefit's packaging, it's so fun and girly! I bought Hervana about a year ago, when Shopper's Drug Mart had an offer going on. For every Benefit product you bought, you were able to choose a free full-size Benefit lipstick! 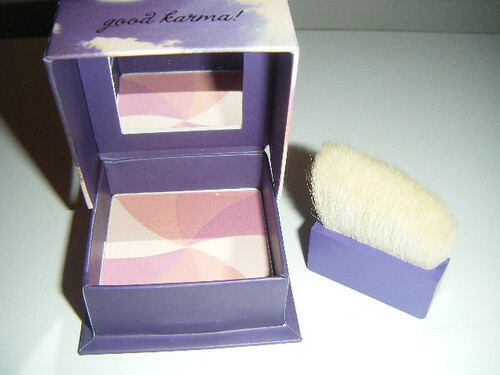 I couldn't resist, so I came home with Hervana, Sun Beam, and two lip sticks :) Hervana is one of Benefit's boxed powders, and is described as a "good karma face powder". This blush is unique since it contains four shades, Lucky Shell, Divine Peach, Heavenly Rose and Berry Delight. You might be able to use these shades individually, but I find it much easier to use them swirled together. Benefit's boxed powders smell amazing, but once they are applied to your face, you can no longer smell them. So, even if you aren't a fan of the scent, I don't think this will play a large role in how you like the product. Hervana comes with a slightly angled brush, which I have used. I find this brush to be okay, but I only use it when I have no other options. I prefer to use a traditional blush brush like the Sigma F40 to swirl the colours together and then apply it to my cheeks. Shades swatched individually, the lightest shade (on the right) is almost undetectable. Here are all of the shades swatched together. 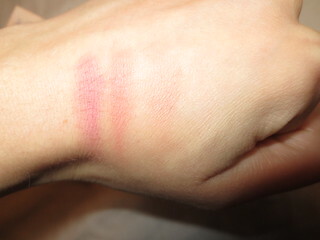 As you can see, this blush is a beautiful peachy pink with slight shimmer. 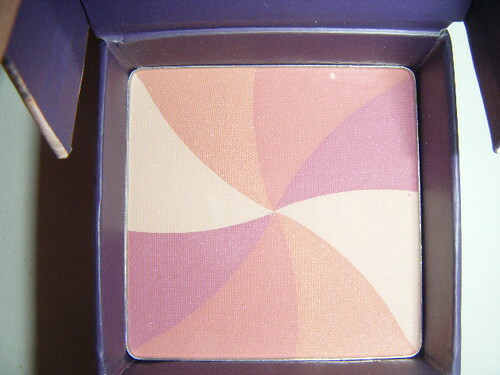 Applied to the cheeks, this blush is quite sheer and light. I always reach for Hervana on days when I'm wearing a bold lip or eye look, and I just want something muted on my cheeks. 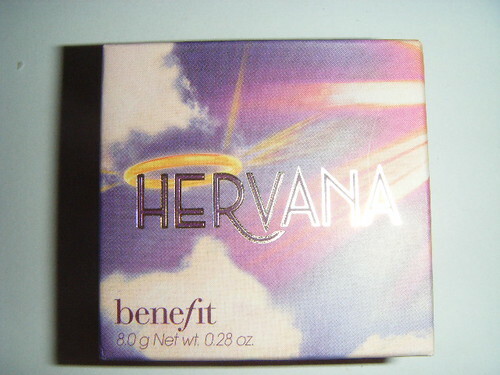 I find that Hervana adds a nice amount of colour to your face, and is very angelic and feminine. Benefit's Hervana contains 8g of product, which is quite a lot. For reference, NARS blushes are 4.8g. Benefit's boxed powders are quite expensive, at $36 CAD, but I think they are definitely worth it! I own Hervana, Bella Bamba, and Hoola (my HG bronzer). I also really want Dandelion and Coralista! Do you own Hervana or any other boxed powders from Benefit? Which ones do you recommend? 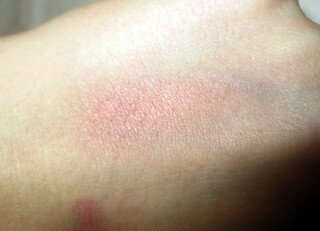 It's a very subtle blush, which is why I think a lot of people overlook it.